Brinnington Park has been transformed over the last six years as a result of the ‘Brinnington Park SRB Project’ (which runs in conjunction with Brinnington Community First). Through engaging members of the local community, and a strong partnership with the Friends of Brinnington Park, real and lasting benefits for the local community have been achieved. Important issues such as safety in the park have been addressed, and exciting new facilities have also been installed. • Re-surfaced internal footpaths and new footpaths to Reddish Vale. • Two football pitches which have had extensive new drainage. 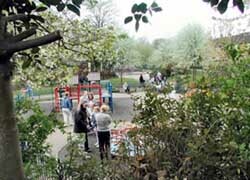 • A Safety By Design Strategy aimed at reducing crime in the park. • New signs and information boards.